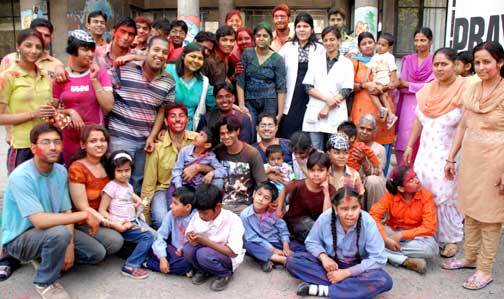 Various College students of Chandigarh come forward to play holi with the special children at Prayas "Rehabilation Center" ,Sector-38,Chandigarh.They spent nearly three hour with the kids.They promissed to children to come after their final exam.Theindiapost/Ankur VadehraIt was a funfilled and happy moment for the children at PRAYAS when students of different colleges came to celebrate Holi with these mentally and physically challenged children at PRAYAS. Students from DAV Sec 10, MCMDAV,Sec 36, CEC landran, distributed sweets, gujiya, caps, and masks to the children. The aim of the children was to spend quality time with the children generally neglected by the society.PRAYAS is an institution for providing facilities for diagnosis and treatment of all kinds of complex disabilities under one roof.